Updated Wednesday March 6, 2019 by HYL. Want more opportunities for player development? HYL provides weekly Wall Ball gym space to all registered players. What: "Wall Ball" is the repetitive throwing / catching against a "spot" on a solid wall. 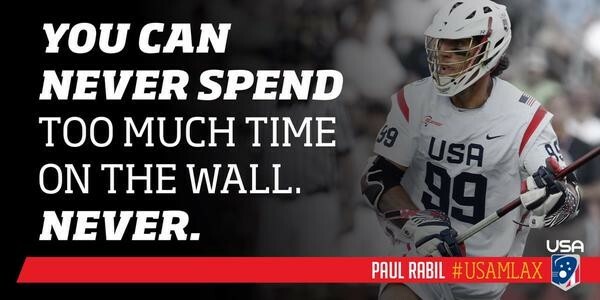 Our Wall Ball nights are "Drop-In" meaning players are welcome to come and go during that hour to get some stick work over the dark cold fall/winter. If focused and used effectively, sometimes just 15 - 20 minutes is all they'll need. Why: Whether a player is just learning to catch or they've been playing for years... this is one of the easiest developmental exercises that makes a big impact. It improves hand-eye coordination, speed of release, targeting (picking a spot), weak hand, and works out glitches in players mechanics. Common glitches to work out are snapping at the ball when catching, too much cradle before release, side arm or off the shoulder throws (should be over the shoulder). How: Players need to bring their own ball, stick, goggles (girls), & helmet (boys). Boys should also wear their gloves but it's not required to participate if they forgot. They should find an area along the sides of the gym with clear space above the wall mats. They pick a spot and begin targeting that spot. The velocity should be at a rate where the ball returns back to the player at shoulder level to catch. If it falls short... throw firmer. If it whips by them... ease up. Experienced players should work their weak hands and quick stick. Developing players can count their catches for encouragement. Take advantage of the additional stick time over our long cold dark fall/winter. It's coordinated and provided by HYL as part of your Indoor 2018/2019 season registration.